There are three types of hardwood floor installation. Glue down - using proper types of adhesives over concrete, wood or any other surface. Depends on the type of adhesive it is a possibility either to apply adhesive over asubfloor or on the each board of a hardwood floor. 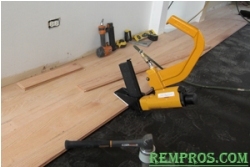 Nail/staple down – using a special nail gun, nail every piece (board) of a hardwood floor to the existing subfloor. In this case, the subfloor has to be wood only. If the hardwood floor needs to be installed in the areas such as a basement or any other where the subfloor is usually concrete use a glue down method or install plywood or wooded strips first. Floating type does not require any attachments to the subfloor. Every board has a special lock with which they are attaching to each other and stay that way. Any types of a floating floor requires underlayment installation which goes on the top of the subfloor. The main purpose of the underlayment is to “hide” minor bumps or imperfections on the subfloor and prevent floor from making noise. Which technique of hardwood floor installation to use? Type of installation depends on the product and area where the hardwood floor will be installed. Most practical is a nail down technique. Nails or staples will hold even not perfectly strait wood planks together without any problems. Glue down type of installation can be used over the concrete subfloor, or where the access is limited and hard to use a nail gun. In many cases, with appropriate conditions installers prefer to put ¾ of an inch plywood over the concrete first and then nail down the actual floor. All solid hardwood requires to be nail/staple down or glue down. If the subfloor is a wood and solid hardwood floor planks 4 inches or wider combination of both nail down and glue down techniques might be necessary. Floating type of installation can be used over any subfloor. It is possible to use this method only if manufacturer produces a product which requires this type of installation. A lot of engineered hardwood floors require floating type of installation. Depends on the product which will be used, hardwood floor can be installed as a random pattern, if planks are different in sizes, or as an uniformed pattern when planks are the same size. But the same size planks can be install randomly creating a random pattern.